« Report research with confidence – Who else wants to publish small molecule LC-MS analysis confidently? During an upcoming webinar on 28th March, you can hear about a new offering for quantitative proteomics. 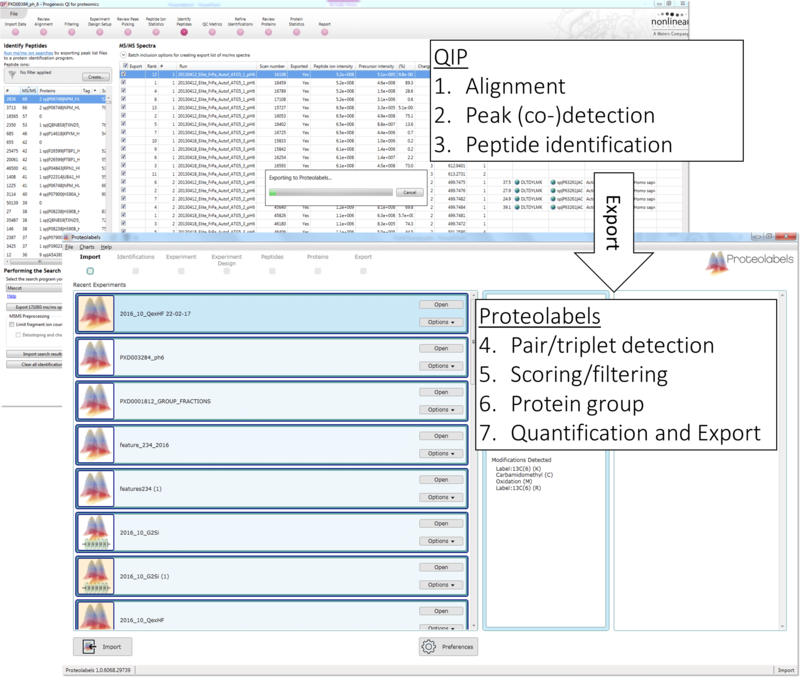 Progenesis QI for proteomics (QIP) now has the capability to analyse samples where stable isotope labels have been added, including SILAC and dimethyl labelling. These capabilities are added through a new module called Proteolabels, from Omic Analytics Ltd. Proteolabels supports data sets from any vendor and search engines that are supported by Progenesis QI for proteomics. 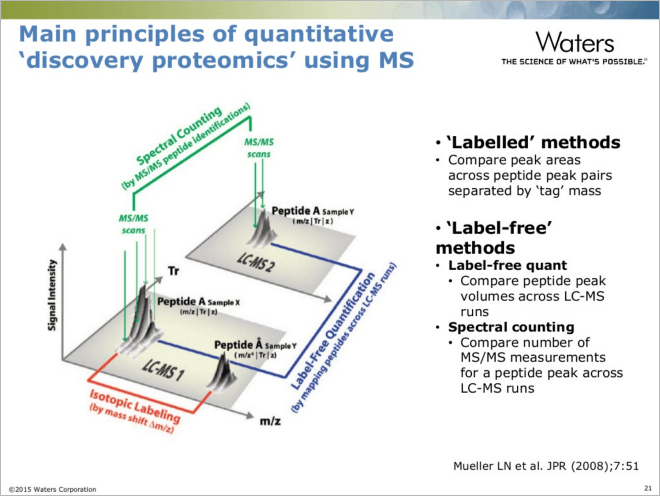 In a regular label-free experiment in Progenesis QI for proteomics, different LC-MS runs are aligned and then, using the co-detection method, the same (peptide) ions are quantified in every LC-MS map. In your workflows, if you introduce an in vivo label on an amino acid (e.g. in SILAC) or following digestion (e.g. in dimethyl labelling), different samples can be multiplexed within the same run, with a mass shift introduced per peptide. Proteolabels is able to detect pairs (duplex mode) or triples (triplex mode) and produce peptide and protein ratios as well as statistics for differential expression analysis. Labs that employ label-free and label-based methods can now use the same software for both types of analysis! Slide from: Discovery and Analysis of Peanut Allergens using Proteomic approaches with Ion Mobility and High Resolution Mass Spectrometry, by Waters Corporation Food Research. How does it interface with Progenesis QI for proteomics? In Progenesis QIP version 3 onwards, there is an option to launch Proteolabels for those customers that have purchased the add-on module. Keeping with the usual workflow, Progenesis QI for proteomics performs alignment, peak co-detection and database searching; thereafter, clicking “Export to Proteolabels” will open the data in the Proteolabels module. Figure 1: The connection between Progenesis QI for proteomics and Proteolabels. If you have the Proteolabels module installed, clicking “Export to Proteolabels” launches the new software and performs downstream quantitative processing. Figure 2: Analysis of one experimental data set deposited in the ProteomeXchange repository (PXD003284 – http://www.proteomexchange.org (1)) exploring co-efficient of variance (CV) across replicates for protein-level ratios. Enabling the feature in Proteolabels to quantify peptides without requiring both to be identified, gives a 30% gain in the number of proteins quantified, with similarly high levels of precision. Since Proteolabels follows on from Progenesis QI for proteomics, there are also sensitivity gains from the co-detection method. This means there are no missing values when analysing multiple replicates or multiple sample conditions, as peptides can be quantified with identification evidence propagated across multiple runs. For example, we ran a simple test on data from one fraction of a public data set – PXD003284 (http://www.proteomexchange.org/) to see the difference between running only a single replicate, versus analysis of that same file alongside two further replicates. As shown in Figure 3, in this analysis, co-detection gains around 75% in the number of peptides quantified, and 39% in the number of proteins. Figure 3: Analysis of one fraction, one sample from PXD0003284 versus the same sample, co-detected with two additional replicates. The co-detection feature in Progenesis QI for proteomics gives a 75% gain in the number of peptides quantified and a 39% gain in the number of proteins in that sample via a Proteolabels analysis. Proteolabels applies a “Peptide Score” to all pairs (or triples) based on profiling the chromatogram match and drift time (where ion mobility separation has been applied). Peptides with a low pair score get down-weighted when it comes to protein-level quantification. As an example in Figure 4, both peptide pairs have been confidently identified, and there is a good elution time and mass/charge match. Most software packages would accept this as a reliable quantification value. Proteolabels is able to detect that the elution profile of the light and heavy peptide on the right panel do not match well and this quantification is likely to be less reliable. 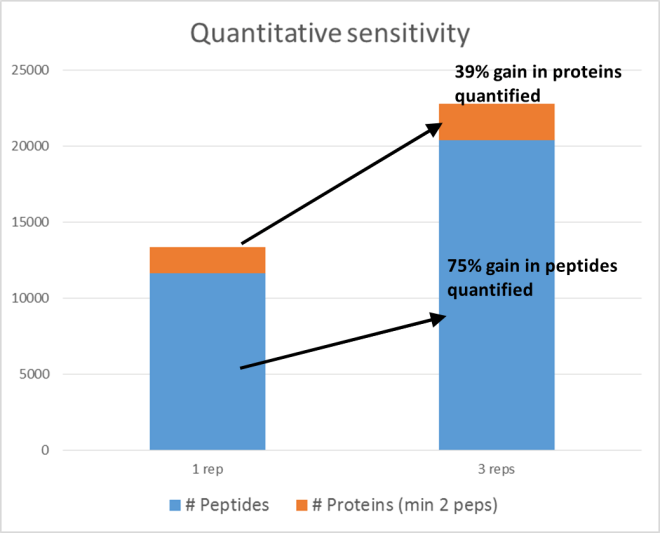 Figure 4: Peptide scoring in Proteolabels detects poorly matched pairs or triples, up-weighting the most reliable quantitative values at the protein-level. How is protein quantification performed? For most proteins, there are multiple peptides reported that could contribute to the final protein quantification value. Proteolabels first performs grouping of proteins based on shared peptides, and then applies a novel weighted averaging of signals based on the Peptide Scores and the signal intensity of peptides to arrive at the protein-level ratio. 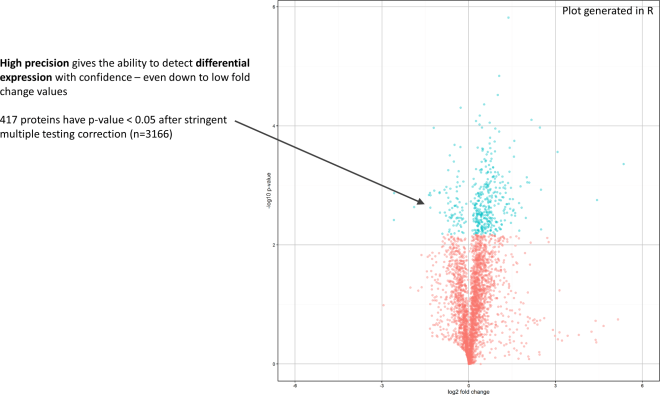 In other label-based approaches, it is common for the protein ratio to be inferred from the median peptide ratio to remove outliers. In Proteolabels, weighted averaging is superior to the median peptide ratio, especially for proteins quantified by a small number of peptides, as it allows all peptides to have some contribution towards the final protein-level quantification value. 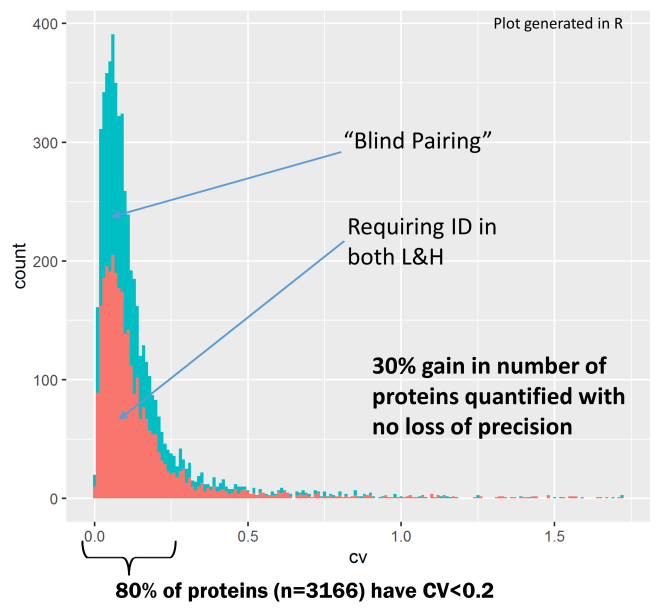 The combination of co-detection, peptide profiling/scoring and intelligent protein quantification affords both high precision and high accuracy quantification (Figure 5). Figure 5: A volcano plot of data from one experiment of PXD003284 data set, processed with Proteolabels. The high-precision from co-detection and pair finding enables reliable detection of differential expression (FDR corrected p-values<0.05), down to modest fold change values. How to check the quality of your data? Proteolabels has a variety of intuitive QC metrics and plots for examining your data (Figure 6), and is interactive at each stage, enabling you to be confident that the data is high-quality, ready for downstream interpretation. 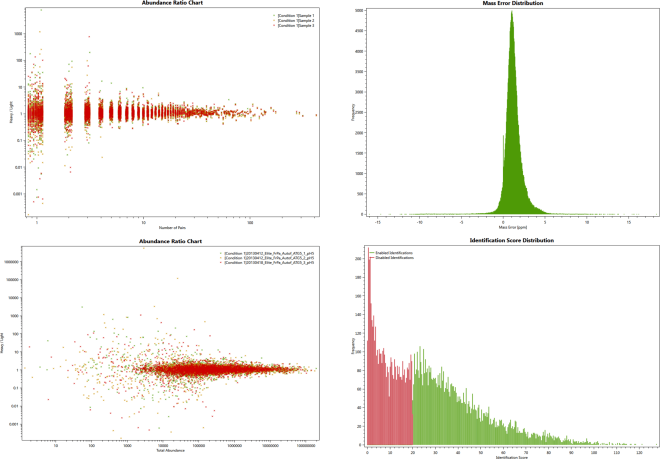 Different plots can show you how well the instrument was calibrated, the distribution of identification and peptide scores, and any relationships between the abundance of peptides and the reliability of the quantification. Figure 6: Proteolabels provides a range of plotting and data exploration features. Do you want to hear more about Proteolabels? If you would like to learn more, please register for the webinar and/or read the press release. If you would like to try Proteolabels, please contact us. This entry was written by Juliet Evans, posted on March 20, 2017 at 7:00 am, filed under March 2017 and tagged Progenesis QI for proteomics, Proteolabels. Bookmark the permalink. Follow any comments here with the RSS feed for this post. Post a comment or leave a trackback: Trackback URL.